To find out what this service provides you can check out our complete list of OurTime.com features. 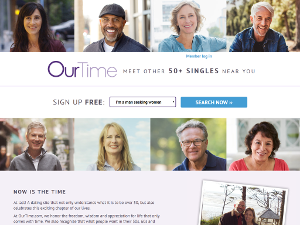 The OurTime dating service for 2019 is the winner of the Dating Sites Reviews Editor's Top Pick - Senior Award. This service is owned by Match Group which is the same company who owns Tinder and is the premier option for single's who are 50 or older. This means that OurTime has the most important aspect of any dating service, lots of active members. OurTime can be accessed by most devices via their dating apps and website including iPhones and Android phones. New members must create a profile and a basic one can be finished in 5 minutes. Make sure you have a few good photos of yourself ready to upload. While they are not a requirement, it is an important part of any dating profile. What paid dating site or app would you recommend for the Single's Choice Award? Voters could choose 1 dating service from a selection of 10 of the top dating services in 2017 as selected by the Editor's. For this award the top voted dating service for the above question receives the Gold, second place gets Silver, and for third Bronze. The recipient of the Gold 2018 Single's Choice Award is Match.com. Match received just over 27% of the votes cast in the poll which is 95 votes. This is a strong showing as it is 7% more votes when compared to last year and almost 5% more votes than our Silver recipient this year. The recipient of the Silver 2018 Single's Choice Award is eHarmony. This popular dating service gathered 75 votes which gave it over 19% of the total votes cast. This is 5% more votes than in the previous year and 6% more votes than the Bronze recipient of this year. The recipient of the Bronze 2018 Single's Choice Award is OurTime. This niche dating service for singles 50 years and older received 51 votes which is almost 13% of the total votes cast. This is the first time that OurTime has been a Single's Choice Award winner which is to be commended especially for a dating service that doesn't cater to the entire single pool. OurTime in 2018 is the recipient of the Editor's Top Pick - Senior Award. OurTime is accessible not only by their website at OurTime.com but also on iOS and Android phones from their dating app. The service is designed for older singles who are 50 or more. At OurTime the basic membership is free and can be completed in a few minutes. You can then decide either to search for members that are compatible with you and spark an interest or, continue on and complete your full profile. As a free member you can search, view profiles and pictures but your communications options are limited unless you purchase a subscription. Paid memberships can cost as little as $15 per month depending on length of term, etc. The dating service OurTime is the recipient of the Editor's Top Pick - Senior Award for 2016. OurTime is accessible via their dating app (for Apple and Android) and website at OurTime.com. The service is designed for singles who are 55 or older and are looking for love. A basic membership is free at OurTime and takes only a few minutes to complete. From there you can either continue on and finish all of the profile, or start searching on the dating service for people that spark your interest. You will be able to view their profile's and pictures but will only have limited communication options unless you upgrade your membership. This Wednesday, June 8th, 2016 at 7pm EST (4pm PST) the dating service OurTime will be hosting a 1 hour live chat session with Dr. Terri Orbuch who is know as "The Love Doctor". She will be answering as many questions she can about relationships and love in the online dating world. If you want to join in on the conversation be sure to ask your question using the hashtag #OurTimeChat on OurTime's Facebook page. Dr. Terri is a professor at Oakland University, a therapist, and an author of 6 relationship books. She has been featured in many national publications including USA Today, Time magazine, and The Wall Street Journal. She also has appeared on CNN, The Today Show, and many other well known TV shows. She is also currently the relationship expert for the dating site OurTime. If only all breakups ended as well as this one. IAC/InterActiveCorp announced recently that Match.com, Tinder, OkCupid, and other dating services would become part of their own spinoff unit. The subsidiary will be called The Match Group and will be a publically traded company. Following the news, shares of IAC rose over 5%. According to the announcement, The Match Group is likely to issue less than 20% of its common stock. The IPO is expected to be completed in the fourth quarter of this year, after which investors will be able to buy stock in the company. So far, the ticker symbol (the three-or-four letter identifications that represent companies on stock exchanges) is unknown. The Match Group is starting out on top. IAC/InteractiveCorp is a $6 billion media conglomerate, and revenue of the new Match Group accounted for nearly one third of IAC's total revenue in the most recent quarter. Last quarter, The Match Group reported revenues of $239.2 million, marking an increase of 13% on a year-over-year basis. Reports say Match Group’s revenues are expected to increase 18% in 2015, bringing the number to $1.24 billion. The hope with separating the Match Group, and combining more established businesses (like Match and Meetic) with earlier stage businesses (like Tinder), is that the move will lead to significant cash flow generation and meaningful growth potential. Or, as Chariman and Senior Executive Barry Diller colorfully put it, “I'm not a believer in simply agglomerating assets in perpetuity. I've long felt that as entities grow into size and maturity it's healthy to give them separation and independence from a mother church." It's an exciting time for the industry, but dating services haven't always done well on Wall Street. AshleyMadison forfeited an IPO in 2011. Zoosk filed for an IPO in April 2014, but withdrew the application in May 2015. Hinge, on the other hand, skipped the IPO entirely, instead relying on raising capital from venture capitalists. In 2014, Hinge had raised $12 million. The Match Group will also face stiff competition from other key listed players like Spark Networks and Jiayuan.com. Still, IAC believes this IPO can give new life to the Group. Estimated EBITDA for The Match Group in 2015 is $264.9 million – and that's excluding the $75 million EBITDA anticipated from Tinder alone. A well-received IPO could not only put IAC significantly ahead of its competitors, but also serve as a litmus test for the entire dating industry.